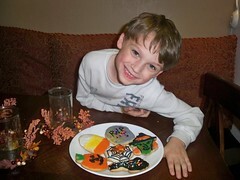 Since we are going to Estes Park, CO for my brother Damion's wedding, Max is missing out on his school Halloween party. So we made cookies for him to take to school. They tasted as good as they look.